Alfonso Rodríguez Castelao was born in Galicia in 1886. After spending his early years in Argentina, he returned to Galicia in 1900 and studied medicine, before working as a civil servant whilst developing as a visual and literary artist. Castelao entered the ranks of the emerging Galician nationalist movement in 1918, swiftly becoming its leader and figurehead. He survived the brutal and immediate consequences of the Spanish Civil War in the summer 1936, taking refuge in Madrid, Barcelona and Valencia, before finally settling in Buenos Aires in 1940, composing along these routes of exile the material that would form Forever in Galicia. 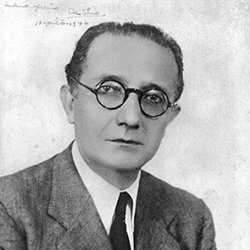 Castelao died at the age of 64 in 1950 of lung cancer. His remains were repatriated to Galicia in 1984 and today lie in Santiago de Compostela.